When you're ready for the answers, click here. None of my compadres wanna take a shot this? Are we not men? something about path of least resistance the 4-5K ohm resistor going to timer motor in timer switch has more resistant than heater coil. 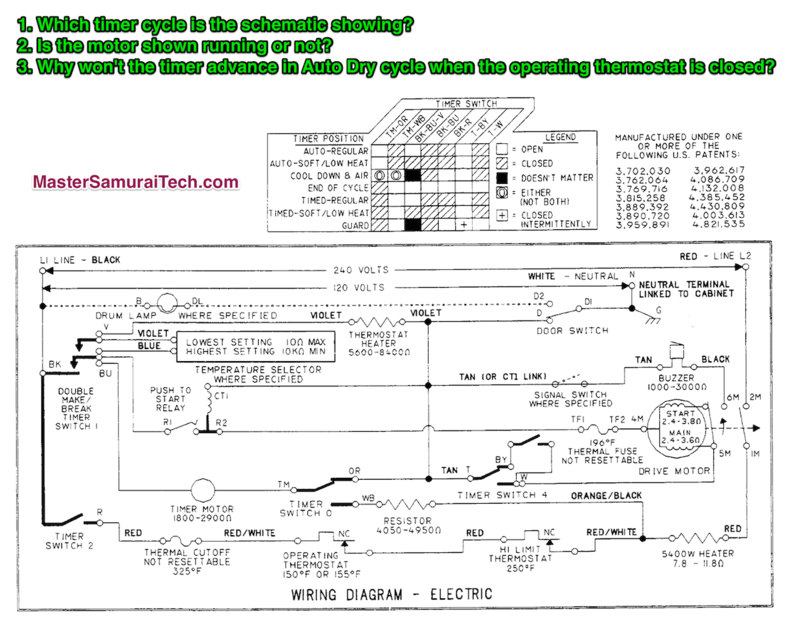 To answer the cycle question, you need to look at the timer chart and compare with what's shown in the schematic. As for the timer motor not advancing question, the key is L1. Do a load analysis on the timer motor and see what you find. The resistor has an important role to play when the timer is advancing (operating tstat open). It becomes a simple series circuit with three loads: heating element, resistor, and timer motor. Can you tell what the job of the resistor is in this circuit? Bonus question: what is the approximate current flow through this series circuit?